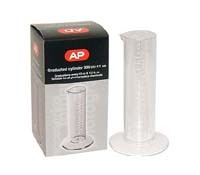 AP brand 300cc / 11oz. graduated cylinder. Clear plastic with graduations in cc's, U.S. fl. oz., and English fl. oz. Suitable for all photographic chemicals.